Many tax advisers are familiar with the large tax incentives related to solar photovoltaic (PV) but are unfamiliar with the large Energy Policy Act of 2005(EPAct) tax incentives available for the concurrent roof replacements and upgrades typically required with a solar project. As roof top solar PV prices continue to plunge more property owners are interested in solar PV, particularly if they have a core corporate sustainability mission or are part of an industry supply chain that rewards sustainability. Tax advisers need to understand the EPAct roof tax incentive if they are going to accurately calculate the rate of return related to solar PV investment. Tax advisers also need to incorporate an economic benefit from possible added market share related to supplier sustainability programs. There are multiple 30% or 10% tax credits available through the American Recovery and Reinvestment Act to building owners for a variety of alternative energy measures, with varying credit termination dates. For example, the 30% solar tax credits expire January 1st 2017 as does the 10% Combined Heat and Power tax credit while the 30% closed loop and open loop biomass credit expires January 1st, 2014. Typically, the ideal solar PV properties are EPAct Roof incentive properties. Normally the best building candidate for solar P.V. is a large warehouse or industrial building. These same buildings are often the best candidates for large $1.80 per square foot EPAct tax deductions. 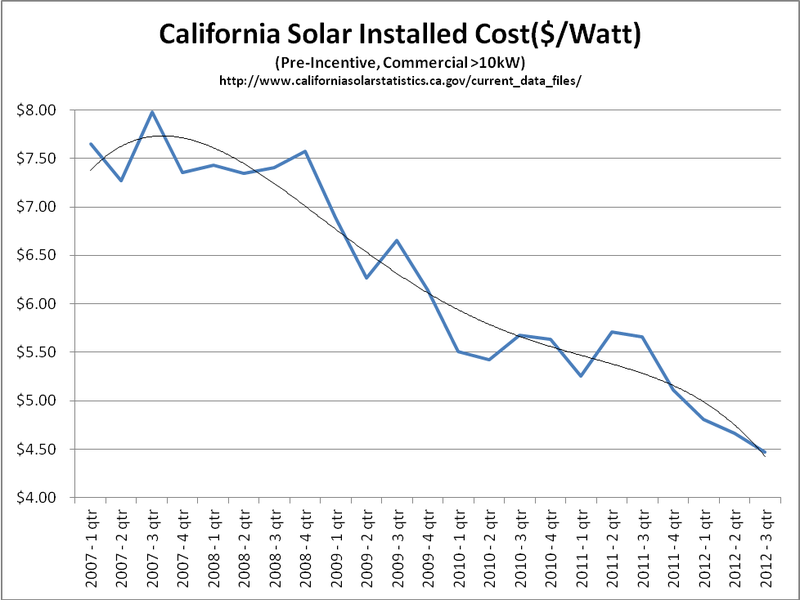 It is evident from Chart A that the price of commercial solar PV has been dropping. In fact, a 40% drop has been seen in just the last 5 years. The rate of decrease is even more pronounced over the last year. With these recent decreases in solar PV prices, many warehouse owners are using the EPAct tax incentives to be fiscally and physically prepared for solar: Fiscally prepared means reducing current electricity and heating costs; physically prepared means making the necessary roof improvements to get the building "solar ready." In order to be “solar ready” the roof needs to be new and capable of holding the increase weight provided by the solar panel. This usually requires removing all old roof layers and laying down a new roof layer. In addition, it is important to confirm that the solar PV installation does not negate any roof warranties. In January 2011, IRS released Rev. Proc. 2011-14, which enables all property owners to catch up on any missing EPAct tax deductions and report them on their current tax return without having to file an amended tax return, a step that can be costly and inconvenient. The retroactive filing is accomplished by filing tax Form 3115 with the building owner's current tax return. This change can be used proactively as a tax planning tool. Building owners who missed one or more prior tax deductions can combine the missed project(s) with a new project and secure a much larger combined tax deduction. For example, presume a property owner installed energy efficient lighting in a 200,000 square foot building for $100,000 in 2006 but missed the EPAct tax deduction. Now presume that, in 2012, this same owner has a new project involving natural gas heaters and some roof improvements for $260,000. Using Rev. Proc. 2011-14, this building owner may be eligible to deduct the entire $360,000 in 2012 ($100,000 prior project plus $260,000 current project). Warehouse and Industrial building owners, purchasing Solar PV have unprecedented opportunities to reduce energy costs, particularly with energy efficient lighting and natural gas heaters. Large EPAct tax incentives are available to support these pre-solar projects but quick action is required as EPAct is due to expire Dec. 31, 2013. See Charles Goulding, Jacob Goldman and Christopher Winslow, The EPAct and Alternative Energy Tax Aspects of Walmart’s Supplier Sustainability Program, CORP. BUS. TAX’N MONTHLY, June 2011, at 13. See Charles R. Goulding, Charles G. Goulding and Jennifer Pariante, The Tax Aspects of the PepsiCo Sustainability Supply Chain, CORP. BUS. TAX’N MONTHLY, To Be Published. See Charles R. Goulding, Raymond Kumar and Jonathan Saltzman, The EPAct Tax Aspects of the U.S. Military Supply Chain, CORP. BUS. TAX’N MONTHLY, September 2012, at 23. See Charles R. Goulding and Charles G. Goulding, Warehouses Cut Energy Bills and Taxes, Business Operating Management, July 2012, at 36.